Chef Michael Hung also knows that gochujang and beer-and-cheese sauce go well together. At his new L.A. restaurant and marketplace, XO on Beverly, Hung has created a quick-service lunchtime menu of modern, all-over-the-map Asian food as well as a more bistro-like dinner menu. Hung is Filipino-Chinese but grew up in New Jersey and considers himself culturally American in a lot of ways. He’s cooked everything from Michelin-starred contemporary French food at San Francisco’s La Folie to smothered tater tots at Mama Lion in L.A.’s Koreatown. When he says XO on Beverly is an American restaurant, part of what he means is that he’s taking flavors from many different places and creating new harmonies. 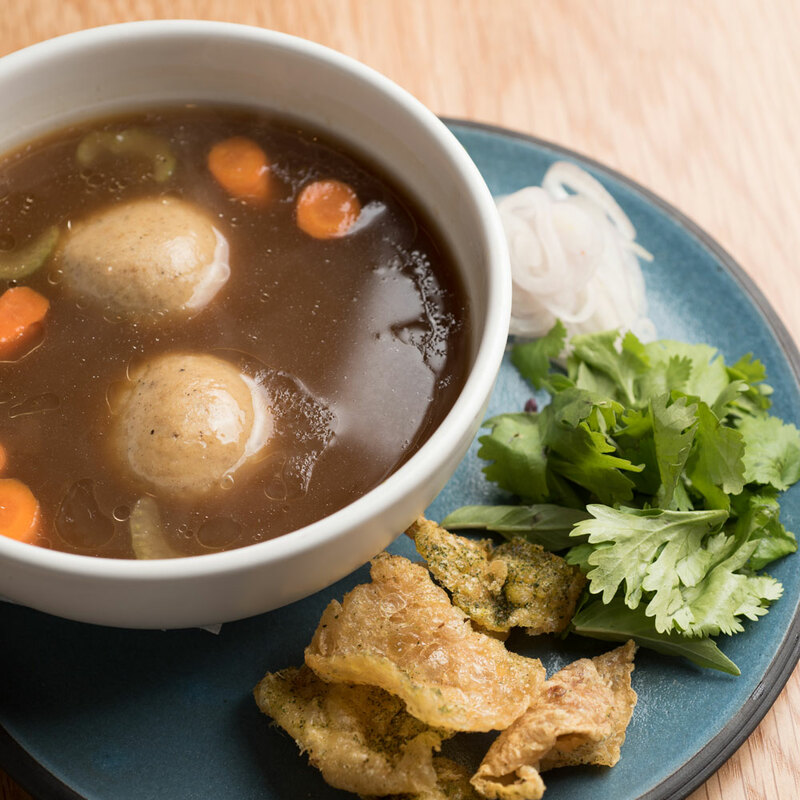 There’s “chicken pho-tza ball soup,” a lovely Jewish/Vietnamese comfort-food hybrid with coriander-scented matzo balls. 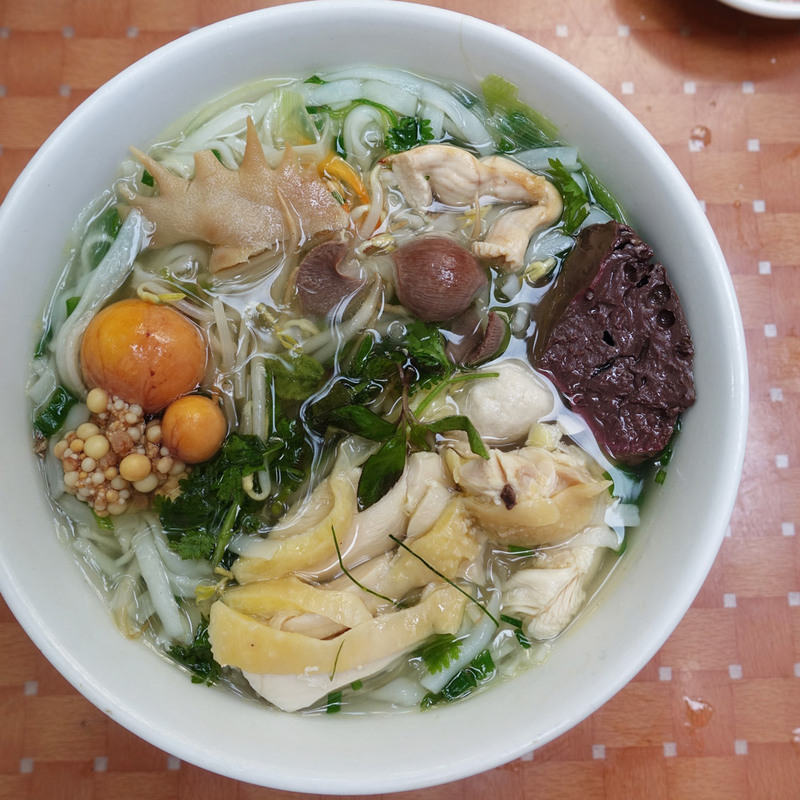 When Hung says he’s scaling back flavors, he means he’s trying to make certain Asian dishes accessible to a wider audience. So he’s serving a Burmese-style salad but dialing back the amount of fermented tea leaves. So Hung has created a fresh, crunchy, bright and tangy salad with heirloom tomatoes, seeds, nuts, herbs and a tea-leaf vinaigrette. The flavors and aromas are well-balanced. This is a hearty salad guests will likely want to eat again and again. But don’t misunderstand. This place doesn’t have fine-dining ambitious of any kind, but Hung is still cooking the way he would in a higher-end restaurant. He’s fermenting tea leaves in-house, a process that takes four to five days. He’s making his own Hunan chili oil for his resplendent and delightfully fiery wontons stuffed with chicken and black soybeans. He’s rescued tuna poke from the land of the boring by putting it in a salad with tamari-and-citrus-marinated rice noodles. He’s serving adobo-rubbed crispy pork belly that’s both his version of porchetta and a reminder of all the childhood parties where he would feast on lechon. He considered roasting whole suckling pigs at XO but remembered that the crispy pork belly was always the part he piled on his plate. XO is a place with fast-casual plates and grab-and-go items, but there are also eight on-tap wines, eight on-tap beers and a dinner menu with steak frites, roast Jidori chicken and fish steamed in a banana leaf with green curry. And then there’s the burger. It’s a quarter-pounder made with a blend of chuck, short rib and brisket on a sesame-seed bun alongside housemade pickles, charred scallion compote, gochujang aioli and a beer-and-cheese sauce. It’s deeply beefy and savory and sweet and umami. It tastes a little Asian and also totally American.